"They loved him here. Brendan was a St. Louis-type of guy, a big Irish kid who didn't take anything from anybody, but he made time for everybody around the team and the town. He fit right into a young team that was up-and-coming." 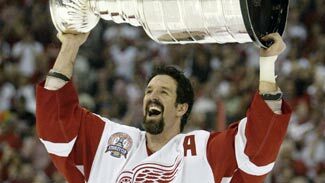 After four seasons with the New Jersey Devils, Brendan Shanahan signed as a free agent with the St. Louis Blues prior to the 1991-92 season. He played four seasons in St. Louis--and statistically, they were the best of his career. He scored 156 goals for the Blues, including 1993-94 when he had 52 goals and 50 assists for 102 points, his only 100-point season. His linemates that season were center Craig Janney and right wing Brett Hull. "Brendan Shanahan was a young guy who benefited a lot from playing with and talking to Brett Hull," said former Blues forward Kelly Chase, now a team broadcaster. "That's when he figured out his niche and how to make himself as effective as he could be. "They loved him here. Brendan was a St. Louis-type of guy, a big Irish kid who didn't take anything from anybody -- but he made time for everybody around the team and the town. He fit right into a young team that was up-and-coming. "It was just fun to watch him evolve," Chase said. "You always knew he was going to have your back. I roomed with Brendan for several years and he and Brett Hull stood up for me at my wedding." Chase was asked if there was a defining moment for Shanahan in St. Louis, and he recalled a beauty. "Charlie Spoonhauer was coaching St. Louis University basketball, before he went to UNLV, and he had a reputation for getting really competitive guys to play for him," Chase recalled. "One night, I got seats by the glass for Charlie. Our president, Jack Quinn, saw him and invited him to sit with him in a private area. "'Nah, I want to sit in Chaser's seats, down where the snot flies,' Charlie said in that drawl of his," Chase recalled. "He didn't know how right he was to become. "The Blues were playing the Winnipeg Jets at the old Arena and Keith Tkachuk comes by and high-sticks Brendan. You know that nasty scar he's got from his lip up into his nostril? That's from Tkachuk's high stick. I came in to see Brendan at the intermission. He's lying on the trainer's table, his lip's peeled back, all the way to the gums. Brendan asks me how bad is it? "I tell him, 'Well, Brendan, look at this way: It looks like more chicks for the Chaser,' and he starts swearing at me. Well, he came out, lip stitched, in the third period of a 0-0 game and got two goals. After that, he went after Tkachuk, hit him a few times and Tkachuk went down. Brendan got an instigator penalty and Tkachuk scored on the power play. We won, 2-1. "Meanwhile, Brendan's bleeding everywhere and talking to Charlie. That's why the people in St. Louis still talk about that game all the time."